The switchblade wing version of the FDL-7C (that is, the FDL-7MC) was the preferred version for the 1964 studies. 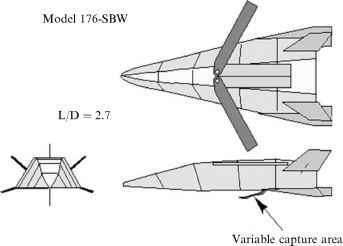 A switchblade wing version of the McDonnell Douglas Model 176 configuration, without a windshield, is presented in Figure 3.22. This was part of the McDonnell Douglas TAV (Trans-Atmospheric Vehicle) effort; that vehicle was powered by either an Aerojet, Sacramento, Air Turboramjet or an airbreathing rocket propulsion system. The inward-turning, variable capture area inlet [DuPont, 1999] provides the correct engine airflow from landing speeds to Mach 5 plus. 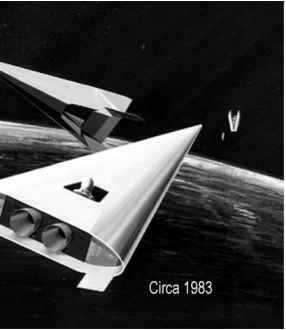 The propellant tanks were cylindrical segment, multi-lobe structures with bulkheads and stringers to support the flat metal radiative thermal protection shingles (similar to those planned for the now defunct X-33). The nose was transpiration-cooled with a low-rate water-porous spherical nose. The sharp leading edges (the same leading edge radius was used for the nose tip) were cooled with liquid metal heat pipes. This approach was tested successfully during the 1964 to 1968 time frame, and found to be equal in weight and far more durable than a comparable ceramic tile/carbon-carbon system. Whenever the landing weights were heavier than normal, the switchblade wing provided the necessary margin for these operations. Figure 3.22. USAF FDL-7C/Model 176 equipped with a switchblade wing and retractable inward-turning inlet for airbreathing rocket applications. mass ratios for launchers much greater than for aircraft (4 to 8, compared to less than 2 for aircraft) runway speed may be impractical for some launchers with high mass ratios. So the principal option is vertical takeoff (VTO), with horizontal landing (HL) remaining viable. However, in some launcher studies, the study directives mandate horizontal takeoff whatever the mass ratio. Many launcher studies have been thwarted by this a priori dictate of horizontal takeoff. In reality, horizontal or vertical takeoff, like the configuration concept, is less a choice than a result of the propulsion concept selected. Horizontal takeoff requires that the wing loading be compatible with the lift coefficient the configuration can generate and the maximum takeoff speed limit. For high sweep delta planforms, such as that of the Model 176, the only high-lift device available is the switchblade wing and a retractable canard near the nose of the vehicle.